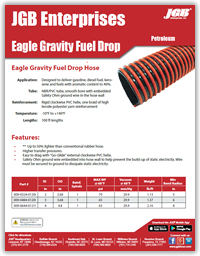 Eagle Gravity Fuel Drop Hose - JGB Private Brand - Hose by Vendor - JGB Enterprises, Inc. Designed to deliver gasoline, diesel fuel, kerosene and fuels with aromatic content to 40%. Contact JGB for proper fitting recommendation and coupling procedure. ** Up to 50% lighter than conventional rubber hose. Easy to drag with "Go-Glide" external clockwise PVC helix. Part # ID OD Reinf.